Minosii aims to provide a way to substitute traditional remotes by the use of multiple accelerometers and gyroscopes. 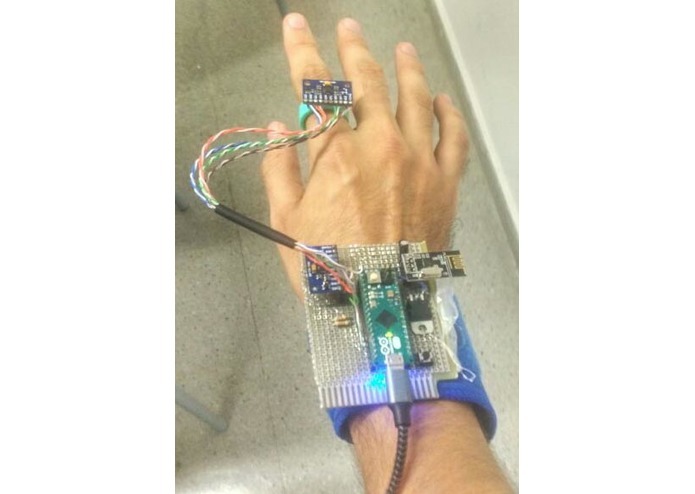 The module on the wrist consist of a microcontroller, a transceiver and the 9-axis sensor used as an axis reference. The 9-axis sensor remaining is on the fingertip. The principle of the protoype is quite simple, the microcontroller reads the value of the two 9-axis sensor and process those value to generate a 3D model of the movement. A simplification of that 3D model is then sent via the transceiver. Started thinking about this idea few years ago... now we can apply it with sastisfactible results. About this project, I designed the robot movement control, the 3D mathematical model to recover the gestures from the read data of the device, and also implemented the funny colorful arrows on the robot frontal display. It was a great project to develop, although we encountered some hard issues to surpass, our effort was greater as we finished the prototype on time.